Building upon the benefits that Pure users already enjoy through deep integration with SciVal Funding and Scopus, Pure now integrates with SciVal – Elsevier's tools to analyze the world of research, and establish, execute and evaluate research strategies. Customers with both SciVal and Pure can now benefit from the benchmark capabilities of SciVal from within the Pure research management platform. These capabilities include the ability to select any group of Pure articles and seamlessly analyze them in SciVal. Users can then take advantage of SciVal's powerful analytics engine, which provides a more comprehensive comparison of research impact against peers, entire subject areas and institutions. 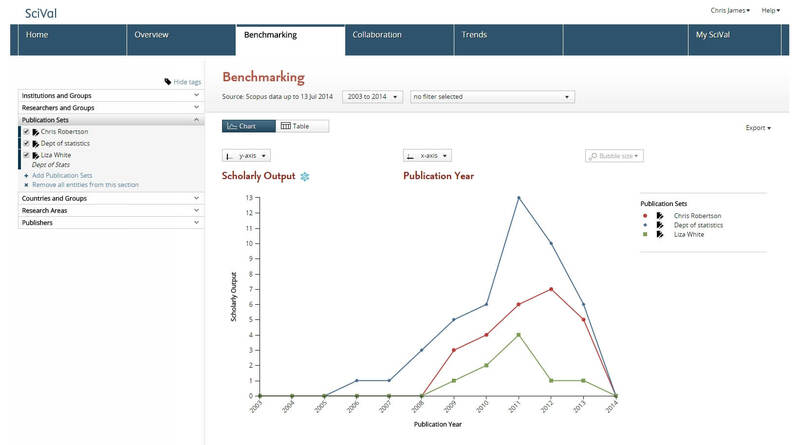 In addition, a range of SciVal research impact metrics will also be visible for Scopus articles included in Pure. Select all publications from one organisation, person or project with just one click, or filter and select any set of Pure-captured publications you would like to analyze in SciVal. All Scopus-matched publications from the set can be seamlessly imported into SciVal for extensive benchmarking against relevant peers. Choose from wide range of indicators to ensure that your findings are informed and robust. 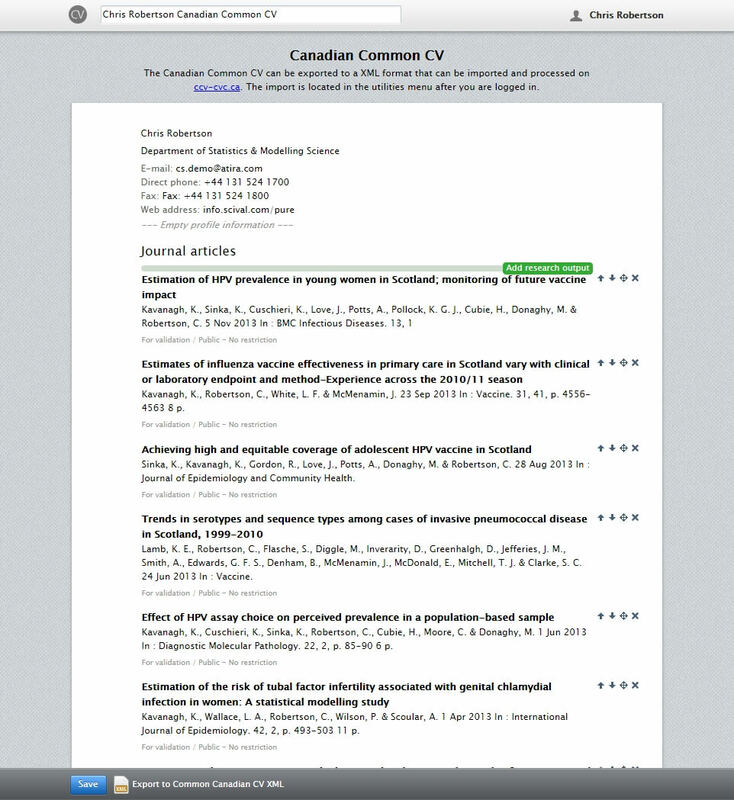 Continuing our support for a growing number of CV standards, the CV module has been enhanced and now makes it effortless to create a Canadian Common CV (CCV). The new template will save Canadian researchers considerable time when creating their CCV for federal, provincial and not-for-profit research funding organizations. Create a CCV automatically for any researcher in Pure. Easily modify the CCV with additional content from Pure, customized, then export it in the CCV XML format. New import options provide additional ways for administrators to keep publication and awarded grant content in Pure current with little effort. Set up a feed from the NIH RePORTER or schedule regular imports from your institution's award management or publications systems into Pure, then showcase and report on the results. Streamline and help manage the data gathering process for the Excellence in Research for Australia (ERA). Following the success of the REF2014 module, the first phase of the ERA module will help support Australian institutions submitting their data to the Australia Research Council's assessment exercise. Enhanced support for the research grant lifecycle through an update to the Award Management module. Research administrators can now streamline the funding application process by managing ethical reviews in parallel to the standard application process. The release also allows administrators to forecast, plan and optimize researcher resources through the capture and reporting of a researcher's actual and planned time commitment to a project. Find the content you need faster through a new advanced search facility, including improved support for Japanese and Chinese queries. The next major release is planned for February 2015.